In the words of The Beatles, “here comes the sun”. At least let’s hope so as, according to the calendar at least, summer is here! The season of marquee weddings, summer fetes and BBQ socials is upon us. That time of the year when the weather has more impact on a mobile’s work than usual. Obviously, you don’t want rain, putting a dampener on your client’s dream summer wedding and potentially even dampening your gear if you’re setup in a marquee with a dubious roof. On the other hand, scorching sunshine also isn’t the DJ’s friend, as it can keep guests away from the dancefloor, especially if you’re setup in a stuffy room, miles away from the open air! 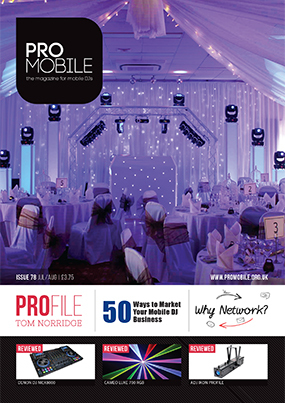 To see you through the summer months the latest issue of Pro Mobile has a varied mix of articles - some serious and others light-hearted - as well as a great selection of equipment reviews and all of our regular features. Having developed a passion for both music and electronics at a very young age, Oxford-based mobile DJ Tom Norridge shares the highs and lows of his career so far in this issue's Profile feature. A varied mix of promotional activities is the key to successfully advertising a mobile DJ business. In this article Pro Mobile's Editor, Eddie Short, offers inspiration by outlining 50 possible marketing activities to choose from. Mastermix Label Manager Richard Lee looks back over UK chart history to undercover the surprising number of enduring pop hits that only made it to the No. 2 spot! Darren Clark, Eddie Short, Glenn Nash, Ian Forest, Jack Wilson, James Humphrey, Richard Lee and Tom Norridge.